I said in this post that I had plans for a nice not-my-design project once I had the latest book sent off. Finally, the book is done (for now) and the time to cast on for my Lithia Park is here. I started working on it a few days ago. My friend Jenni is knitting one too and we decided to cast on a knit night. We had a little trouble getting started (we were convinced our collar wasn't looking like the pattern photos), but once I came home and worked on it with no distractions I realized we were doing just fine (and if our collars aren't exactly like the photos in the pattern, oh well, I like how mine looks anyway). It's been a little slow going. 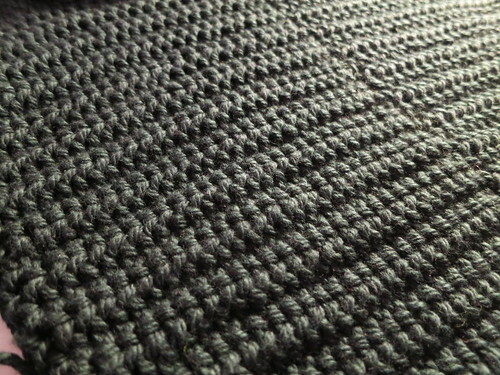 The collar uses knit-1-below and purl-1-below stitches, and those are verrry slow for me to knit for some reason. I love the way the fabric is coming out though, so it's worth the time. 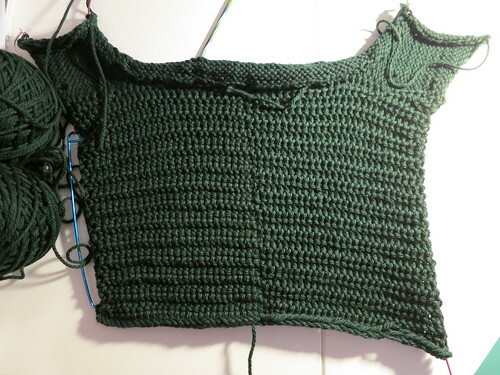 This is actually the "wrong side" of the sweater, but it's the side of the collar that will be facing up when it's done. That is some nice texture! I'm definitely loving the stitch definition that I'm getting with the Spud & Chloe Sweater yarn. So, I'll keep plugging away. I'm hoping to have it done to wear at Thanksgiving. This sweater is so fun and interesting to knit I don't think I'll have a problem finishing it by then (plus the body is pretty much stockinette so that part should go way faster). What WIP have you got on this lovely WIP Wednesday?